Shelley Arrott, Lynn Williams and Dwight Pickering. 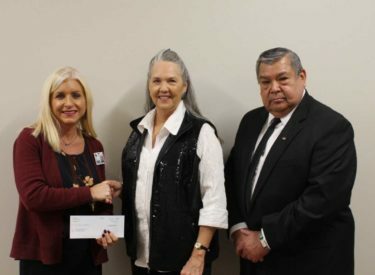 Dwight M. Pickering, Kaw Nation 477 Director, and Lynn Williams, Chair of the Kaw Nation, presented a $1,000 donation to the Ponca City Public School district. “The Kaw Nation is a strong partner with local school districts to help support the education of their children. Mr. Pickering and Ms. Williams visited Ponca City High School and met with high school Principal Thad Dilbeck and Chris Little Cook, Title VI Coordinator. We appreciate the relationships we have with our Native American partners in education as we strive to honor the culture and traditions of the tribes,” Superintendent Shelley Arrott said.